Let’s talk about Kicks shall we? If you aren’t yet familiar with the term kicks it’s what us New Yorkers call sneakers. Sneakers and I have this weird long history that will have to be shared in another post at another time. If I’m going to discuss kicks in any realm, I think it’s best I start out with the brand I’m rocking in the picture above, Saucony. 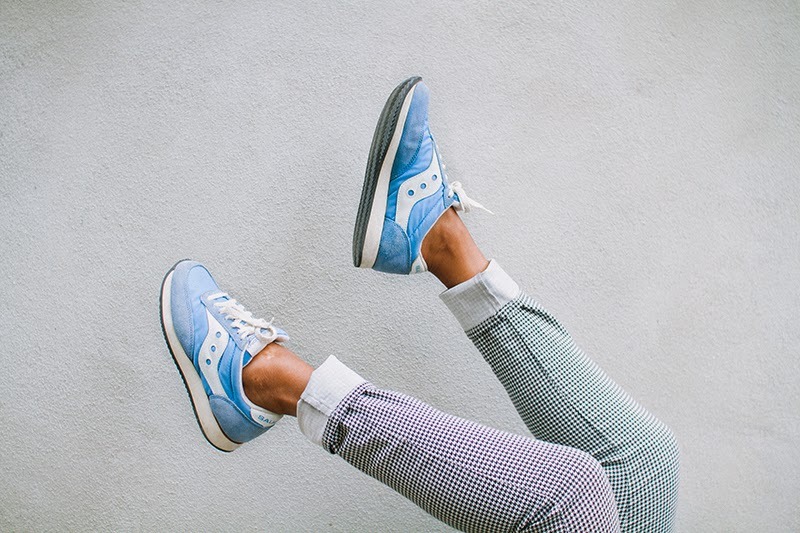 Oh, Saucony sneakers, what a deep and odd love affair we’ve had. When I was a kid growing up, during a time my sister and brothers were pretty obsessed with Nike Air Max and Jordans, Saucony was my love. They came in a bunch of different color combinations and it felt weirdly evident that they just “belonged to me.” For me and just me only. Oh to be a kid. Each combination seemed like what a toothpick girl who liked to dress in vests and animal prints would want and need to wear. I felt odd and yet, super cool and different when I rocked a pair. My Saucony days lasted for months, maybe even a year or so before it ended. One random day I decided Saucony sneakers were no longer for me. I believe the sudden abruption of my love affair was a combination of the brand no longer continuing to produce more styles and my over abundance of love for them. Seems odd right? How does one obtain an over abundance of love for a brand? But it happens to me quite often. I delve deep into a product for months, maybe a year and then I’m done. There is usually no rhyme or reason, no trend to associate with this, and no specific time frame. The break up just-happens. Here we are, years later and I’m back in love with my Saucony’s. My new love is a combination of comfort, style, and- dare I say- trend. Remember this post? Blues, the lights and the layers of it, I’ve been giving it a good run for it’s money. Now as I finish this last leg of my pregnancy, my body only needs garments of the upmost comfort. After a 10 year hiatus, my Saucony’s felt like air beneath my swollen and very pregnant toes. And here we here are, dating again. Above are a few ways I love to rock my comfy kicks. Have you given this trend a try yet?